I really enjoy looking at bathroom design ideas, paging through the interior magazines over the weekend and finding out what is trending and what looks good. While I do like white clean finishes in bathrooms, I tend to prefer more bold bathrooms with a modern look. Especially dark details and different materials for the walls and roof design of the bathroom. Marble is a big favourite of mine because it’s so classic and lifts up the room. Lighting in any room is very important, but in the bathroom if you get it right – you can create just the right mood for the room that only enhances the design. Here are some photographs for this weeks lookbook. Enjoy! Waking up to lighter mornings and hearing the birds starting to chirp are just some of the things I look forward to in the Spring. With the change of season, it is also really fun to start planning or getting out the outdoor furniture. Since our move, we have to get new outdoor furniture. So I have put together some balcony design ideas for this weeks lookbook. Even with a smaller balcony, you can still make a really beautiful outside space. I really liked the one with the hammock, and that is something we are going to set up. Hammocks don’t take up allot of space and easy to clean, also they look great on any balcony. Using plently of potted plants is something I am going to try do more of this year – and hopefully up my gardening skills too! Looking to get a new headboard, so I thought I would share my inspiration board with you guys in the search of finding the perfect headboard. There are so many pretty headboards to choose from, the style that I am clearly drawn to are the fabric, glam types. I like the look it gives on the darker wall in our room. A great tip to protect your fabric headboards from getting stained, is to spray it with protective fabric spray. This is a helpful tip, if you are leaning towards a lighter coloured fabric headboard. Here are some of the headboards I have been looking at. Enjoy and happy monday! So excited to be back with mondays lookbook! 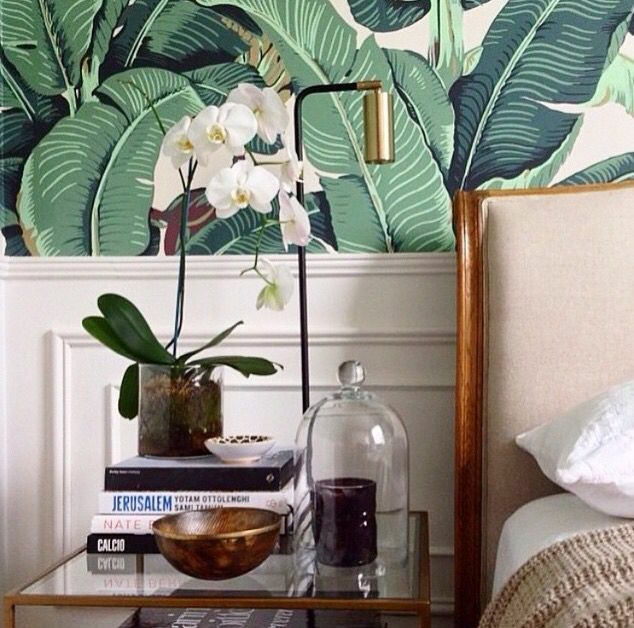 What are your thoughts about the banana leaf wallpaper? It’s been used in the famous Beverly Hills Hotel. I was super lucky to stay at this hotel when I was younger, and I remember all the extravagant materials and details of the hotel so well. I would love to be able to go back there again, and see the place all over again. 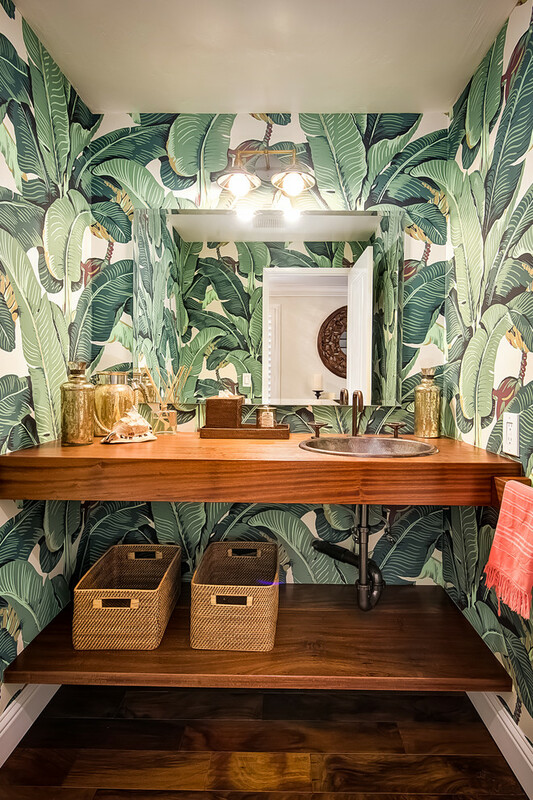 Even though it’s probably a big commitment to choose a wallpaper with that much pattern, I think that with the right accessories the right look can be achieved. The coloring of the leaves pair really nicely with gold accessories and wooden detaisl. I think it brings so much of energy to a room, and can create a really fun mood in a smaller spaced room. We have a guest bathroom which I am looking at getting done, it is a small space but I am keen on finding this wallpaper and creating a really lovely space. This year started off with bang for the property market in Oslo. Prices just in the city have increased by 10% conservatively. There are many properties listed in already in the first month, making it easy for buyers to be selective with their choices. After spending the holiday season in South Africa and celebrating the New Year there, I landed in Oslo and just hours later met and secured a property which I am looking forward to showing end of January. It is good to get back to routines and starting new projects! How has your 2016 been treating you so far? I am busy putting together ideas for our new entrance. Trying to put together something that is practical as well as making sure it looks beautiful. No clutter. Having fun going through ideas and figuring out what works for our space. The entrance in the new place is slightly bigger than what we have now, and much more practical for winter months with the shoes and jackets. Our space does have a mirror cupboard with good storage. I think what’s clear is that I want a large statement mirror in the hallway! Here are some ideas that I have put together for this weeks lookbook! I got really motivated after reading a post from Barbara Corcoran, a woman in business that I have followed for a long time. After watching her on Shark Tank in the early episodes, I always remember her leaving a big impression on me because of the decisions she made and how she carried herself. I have since read and followed her journey. Here is her Wednesday Wisdom, and this was my frame of mind while we were in New York. Welcome to Real Estate by Demi. Looking forward to sharing upcoming listings, property news, styling inspiration and much more. Stay tuned in. It will be worth your time.